Exciting news, dance lovers! 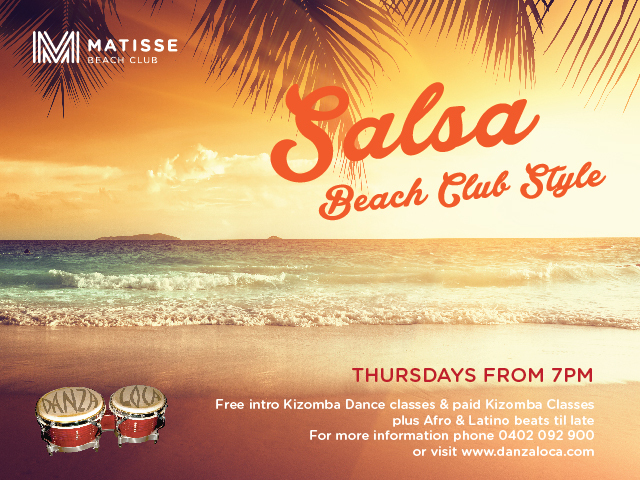 Danza Loca in partnership with Matisse Beach Club are launching a dedicated Kizomba night, minutes away from balmy Scarborough Beach beginning Thursday, February 12th. As an special launch day offer, ALL classes will be FREE for February 12th. Bring your friends along to check out Kizomba’s sensual rhythms in this hot new venue! Join the Facebook Event to add to your calendar, or check out the class page for more info!